I have a big grocery store crush on Wegmans, the family-owned, privately held 80+ chain centered in New York and extending, by the end of 2011, to five more states. The closest to Kentucky is Virginia, where there are six stores clustered in the east not far from Washington, D.C.
Once a year I make an annual pilgrimage to one of nineSyracuse area Wegmans. This year I visited relatively early on a Friday morning. As I looked at one of the many sections of prepared and semi-prepared food, trying to decide what to put in the cooler for lunch, two white-coated chefs and a manager in a black polo shirt stopped beside me. As I stared at the "Fresh Blueberries" sign on the salad bar in front of me, the manager said to the two chefs, "See, here where you have "Fresh Blueberries?" It needs to have the name of the local farm where you bought them. Those are local. And your local lettuces for the Caesar salad—put the local farm name on them. People want to know where their food comes from and your food is beautiful. Add the farm names." Ahhh, yes. We customers like to know where our food comes from. A couple of hours later, on the Mass. 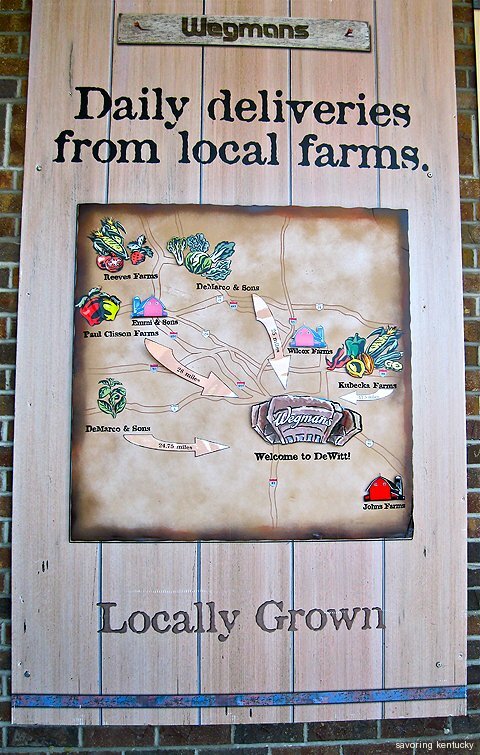 Turnpike (I-90), official blinking signs announced that fresh local produce would be for sale at the next rest area. Within a couple of miles, we pulled into Lee Plaza East. Just outside the entrance to a standard American fast food-fueled rest area, we ran into garlic scapes, fresh cucumbers and squash, cabbage, and an empty spot where our favorite Butter and Sugar sweet corn had just sold out. Betsy McCarron of The Farm Stand at Colrain, Massachusetts, told us she drives a large white truck loaded with vegetables two hours one way to sell vegetables each weekend and on holiday Mondays during the growing season. The Massachusetts Turnpike Authority encourages farmers to sell at rest areas throughout the state. Farms pay nothing for the space. This seems a wonderful way for states to support increased farm income. The juxtaposition of beautiful green and yellow vegetables just outside a fried food haven reminded me of Jamie Oliver's recently concluded Food Revolution/Los Angeles series. The ABC producers and editors delighted in showing the contrasts between the all-brown of fast food and the all-colors of fresh food. Maybe the beauty and access to fresh food convince some travelers to forego the double fries and munch on blueberries. Betsy McCarron said she makes sure there is always something portable and ready to eat at her stand. Betsy says the Commonwealth of Massachusetts expanded the turnpike market program this year, extending it throughout the state. 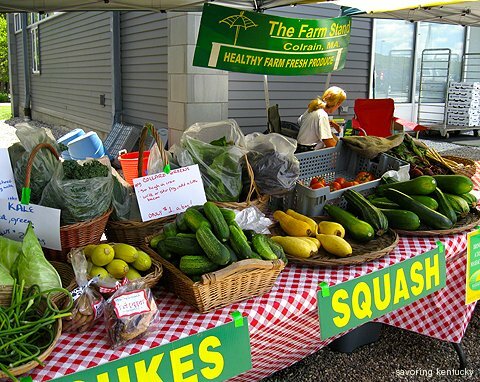 Kentucky transportation, agriculture, tourism, and health authorities, and Kentucky legislators - how about farm stands along all our major highways? That would make a lot of us Kentucky Proud.